Kirkpatrick have been manufacturing quality black cast iron door and window furniture at their Willenhall works for over 160 years. Each piece of ironmongery is lovingly crafted by hand over a six week period ensuring a uniqueness and authenticity that is second to none. 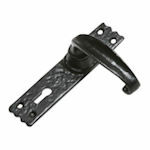 Our Wealden Black Iron range is an extensive selection of products from the Kirkpatrick portfolio and includes hinges, door handles and knobs, Suffolk and Norfolk thumb latches, ring latches and ring handles, letter plates, bolts, pull handles, door knockers, window stays and fasteners and many additional products. Select Antique Black finish for a traditional decorative rustic look or Smooth Berlin Black for a more austere, municipal feel. 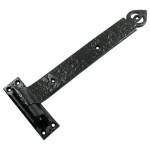 Traditional, decorative Tee Hinge designs for full height doors and smaller cabinet doors in Antique Black & Birlin Black cast malleable iron and in sizes from 5" (127mm) to 22" (556mm) long. Part of our "Wealden Black Iron" collection and manufactured in Britain by Kirkpatrick Ltd.
A range of False Hinge Fronts in Antique Black cast malleable iron to add decoration to internal or external doors around the home. Available in sizes from 6" (152mm) to 21" (533mm). 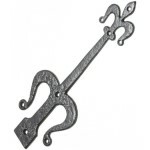 Part of our "Wealden Black Iron" range and manufactured in Britain by Kirkpatrick Ltd. 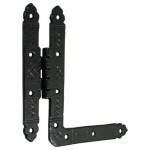 Traditional Hook & Band Strap Hinges (Pintle Hinges) in Antique Black cast malleable iron for internal & external doors & gates. Available in a full range of sizes from 11" (283mm) to 26" (657mm) long. Part of our "Wealden Black Iron" range & manufactured in Britain by Kirkpatrick Ltd.
Additional hinge types including Cabinet H Hinges, HL Hinges, Snake Hinges, Butterfly Hinges & Cellar Flap Hinges in Antique Black cast malleable iron & manufactured in Britain by Kirkpatrick. 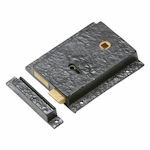 Also detailed are steel & stainless steel hinges colour coated to match our Wealden Black Iron products. A range of stunning, exceptional quality British made surface mounted Rim Locks, Rim Deadlocks & Rim Latches in Antique Black & Smooth Berlin Black to match our Wealden Black Iron door knobs, or in unfinished raw iron. 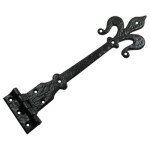 Over 15 designs of traditional cast malleable iron door lever handles for locks, latches & euro cylinder locks in Antique Black & Smooth Berlin Black finish. Part of our "Wealden Black Iron" collection and manufactured in Britain by Kirkpatrick Ltd.